This Pasta Amatriciana recipe is a very quick pasta sauce that can be made in advance. I will often make it in the morning and then simply boil the pasta later in the day and reheat the sauce. 45 grams Parmesan Cheese – shaved for topping on to meal just before serving. 1. 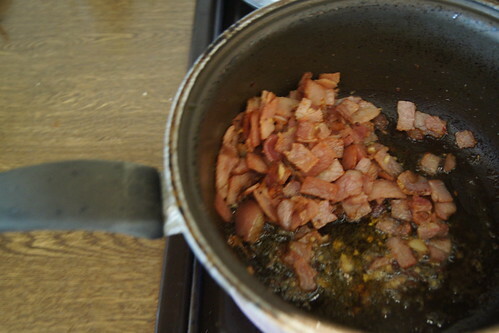 Heat oil in a pan and cook bacon for 2-3 minutes. 2. Add onion and continue cooking until onion is soft. For some reason we only had a Spanish onion on this occasion! 3. Add chilli and stir for a minute. 4. Add tomatoes, once mixture is bubbling turn down and simmer for 5 – 8 minutes. Begin cooking pasta. 5. 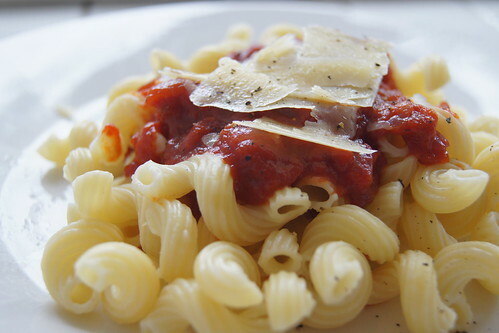 Once pasta is cooked, place serves of pasta into bowls and spoon sauce on to pasta. Top with parmesan cheese and cracked pepper. Do you have a fave quick pasta recipe? If so feel free to share it in the comments below, I am always after new ideas! 45 grams Parmesan Cheese - shaved for topping on to meal just before serving. Heat oil in a pan and cook bacon for 2-3 minutes. 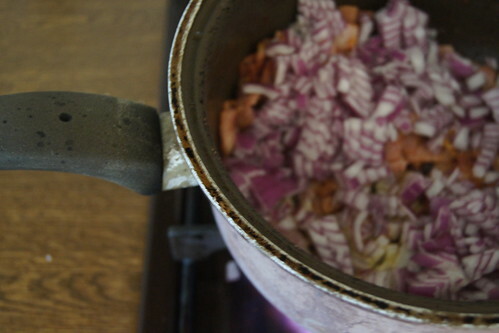 Add onion and continue cooking until onion is soft. Add chilli and stir for a minute. Add tomatoes, once mixture is bubbling turn down and simmer for 5 - 8 minutes. Begin cooking pasta. 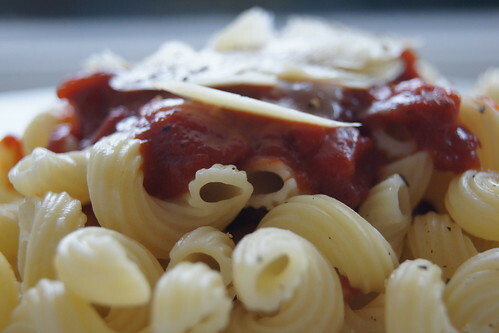 Once pasta is cooked, place serves of pasta into bowls and spoon sauce on to pasta. Top with parmesan cheese and cracked pepper.